Grassroots Fund grantees from the Northern California Environmental Grassroots Fund (Grassroots Fund) are encouraged to increase their effectiveness by expanding their organizational and administrative skills through a capacity building mini-grant. Please review the following information before applying. The Grassroots Fund’s Grow Your Roots Mini-Grant provides money to help Grassroots Fund grantees attend trainings, hire consultants, and purchase materials to develop organizational skills such as fundraising, bookkeeping, communications, board development, personnel management, computer skills and IRS 501(c)(3) issues like lobbying. …And much more! 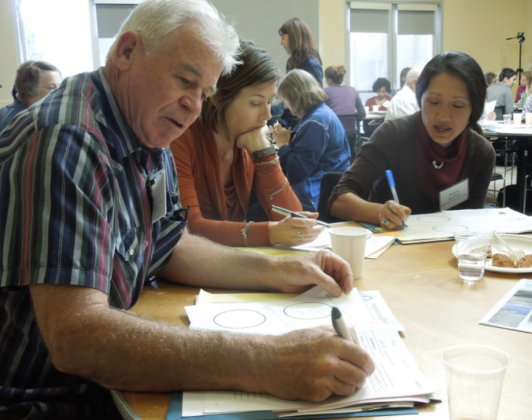 Explore our Resources Page to find capacity building resources for your organization. All grant recipients of the Northern California Environmental Grassroots Fund within the past four years are eligible to receive up to $330 of mini-grants per year. We believe that boosting your group’s “back office” capacity will help you achieve greater success in all of your program work. The mini-grant covers 80% of the costs of a training, consultant, or other materials, and requires a 20% match from the grantee. (For example, if a training costs $100, the Grassroots Fund would pay $80 and the grantee would pay $20.) Additionally, those traveling more than 75 miles round trip to attend a training will receive a modest travel stipend. A grantee can send more than one person to a training, or send a representative to multiple trainings, but the most that will be awarded to any one group is $330 per year, not including travel reimbursements. Being awarded a mini-grant does not change your group’s eligibility for regular grants from the Grassroots Fund. We hope that you will be able to take advantage of the mini-grant program. Please feel free to contact us if you have any questions. And, please give us feedback about how well the mini-grant works, or does not work, for you. Telling us about your experiences will help us improve the mini-grant program to make it better for everyone. Click here to review eligibility for the mini-grant. There is no deadline, but if you are applying to attend a training or webinar, we must receive your application 14 days prior to the event’s date. Before applying for a mini-grant, please read these Frequently Asked Questions which explains deadlines, what types of trainings are in-bounds, who is eligible for a travel reimbursement, and more. When applying for a mini-grant, you can use this list of training providers as a resource. There are options for workshops in nonprofit management, fundraising assistance and much more. Mini-grants are not limited to this list of providers. Check for classes at your local community colleges and adult education schools. To fill out a web form, click here. If you are unfamiliar with our online system, contact us for assistance. If you need the application in a different format, please contact us. The Rose Foundation will send a check made out to the grantee organization (or fiscal sponsor) in 2 weeks or less. This check will include travel reimbursements if applicable. You are responsible for enrolling in the training with the training provider directly (don’t send any training registration forms to us).